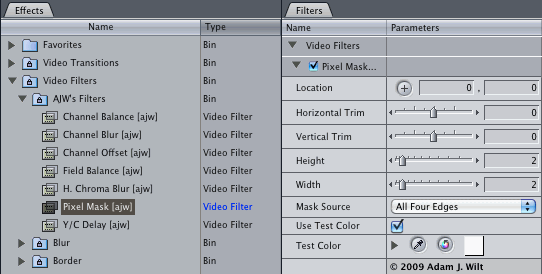 AJW's Filters for Final Cut Pro: Fix DV's steppy chroma; mask bad pixels, blur and offset channels, etc. 525/59.94 DV and DVCAM uses 4:1:1 chroma subsampling. The coarse chroma resolution causes all sorts of steppy edge problems in chroma keying and in "upconversion" to 4:2:2 or 4:4:4 output formats. Some DV codecs, like Avid's, filter or smooth the chroma on decompression (details here). Others, like Matrox's, let you turn chroma filtering and interpolation on or off as you see fit. But the Apple codec used in Final Cut Pro doesn't give you any choice: it's steppy edges, all the way. I got tired of trying to fix the problem with the matte chokers, so I wrote FXScripts for (a) a chroma blur and (b) a Y/C offset, to make keying easier and better, and to improve the quality of still frames I pull from DV footage in FCP. And then later on I wrote some more. And here they are. They're free. Download them here. Channel Balance - adjust the gain and level of RGB or YCrCb (YUV) channels independently. Channel Blur - selectively blur RGB or YCrCb channels independently. If you select YCrCb, and blur Cr and Cb about 2-4 units, it makes a passable-fair chroma smoother for 4:2:0 progressive-scan footage. Channel Offset - tweak the positions of RGBA or YCrCbA channels independently. In YCrCb mode, it’s useful for shifting chroma to correct for multiple generations of analog, color-under recording. Field Balance - adjust luma and chroma gains on Fields 1 and 2 of an interlaced image independently. Very useful for correcting field imbalances caused by mismatched head amps in dual-head, helical-scan analog VTRs. H. Chroma Blur - an alternative to FCP’s own 4:1:1 and 4:2:2 chroma smoothers (and predating them, grin), this lets you adjust the horizontal blurring and offsetting of the chroma signal to correct for color-subsampled recording formats like DV. Sometimes Apple's filters work better. Sometimes mine do. Pixel Mask - Hide a dead or hot pixel (and its surrounding compression artifacts, if necessary) with a mask made from adjacent pixels. Read this article for details on Pixel Mask, and on how to write your own FXScript filters. Y/C Delay - this is a streamlined version of Channel Offset: it just repositions chroma with respect to luma so that colors that have shifted from too many generations of color-under recording can get put back where they belong. It can also be useful in repositioning subsampled chroma for cutting a key with; sometimes a slight leftwards (negative number) offset makes for a better-aligned matte. Download them and unzip them; you’ll get a folder called “AJW’s Filters”. Drop it into /Library/Application Support/Final Cut Pro System Support/Plugins. Start (or restart) FCP. Hey presto: new filters! Use them, take them apart, rebuild them, modify them for your own nefarious needs based on your own brilliant brainstorms. Throw some or all of them away if they bore you. That’s freedom, isn’t it? Note: these filters are provided with no warranty or guarantee of suitability or fitness for any purpose whatsoever. Use 'em at your own risk. All materials on this page copyright © 2010 by Adam J. Wilt. retained. Copying this content to another website (instead of linking it) is expressly forbidden.